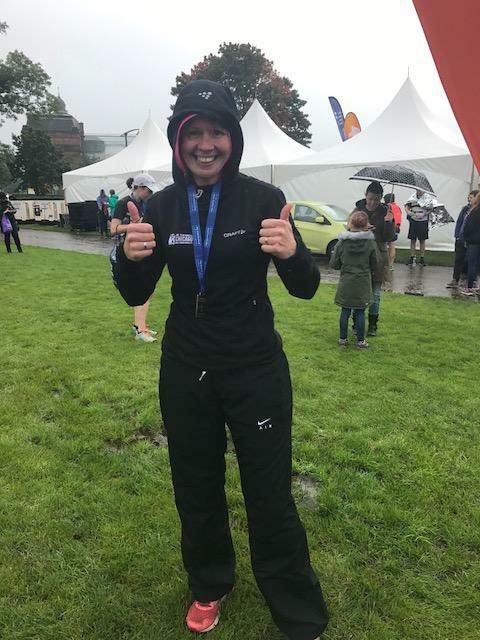 It maybe wasn’t the best idea to take two weeks leave right before the Great Scottish Run Half Marathon (and do hardly any running), but I’d run a good wee half marathon a few weeks ago at the Kilmacolm Half Marathon and I told myself I wanted to put more of a focus on enjoying the event / run at the GSR this year. I’d had a week away in Portugal, then a rather busy week with life and work stuff, preparing for things coming up, not sleeping to well, and generally not stopping. 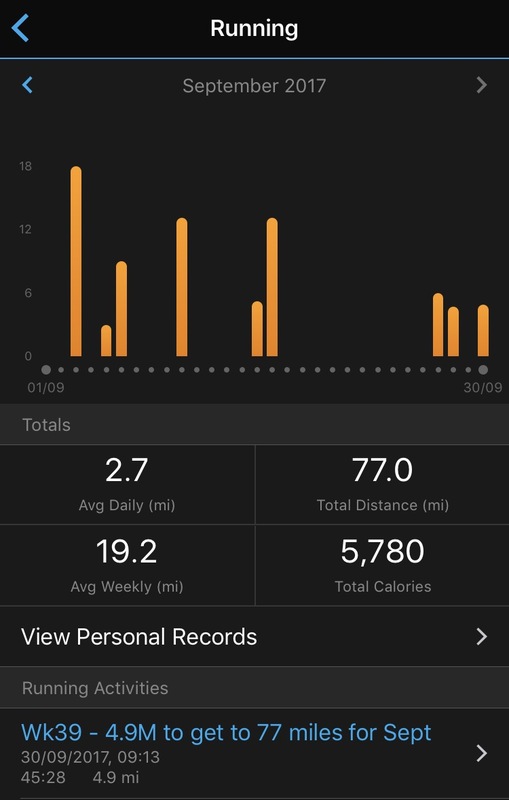 I didn’t run at all the week I was in Portugal, and had around 10 days off running after my last long run. I came back to a comfortable run on the Wednesday with Lesley, she probably took my mind off the running. But my HR was probably higher than it normally would be. 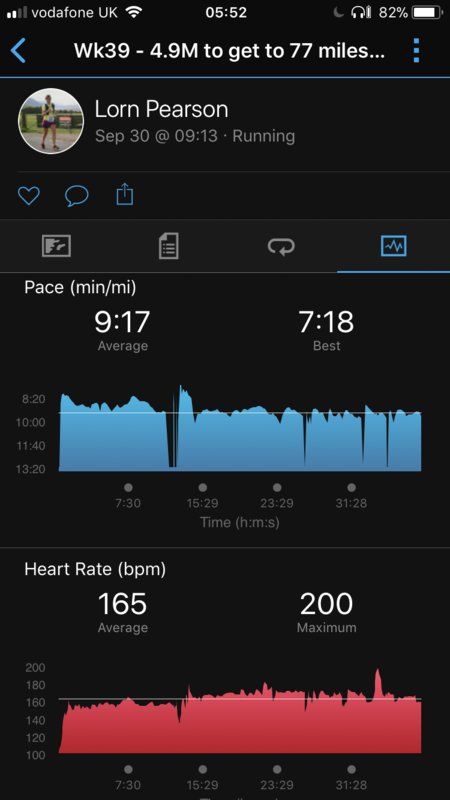 Then a good and comfortable 5 miler on the Thursday… avg HR 151, then a tough and horrible 5 miler on the Saturday. My heart rate was away up, and I made myself slow down to take it easier. (It wasn’t 200 max, that was a blip, but it was higher than normal). On top of that, I woke up on Sunday with less sleep than planned, I had a lot going on, I didn’t feel great. The weather was going to be horrible, and Fit Girl asked me if I maybe wanted to give it a miss. And for a bit at about 9am, lying in my bed, I did give it some thought, but decided I’d better get up and do it. So at around 1045 I was out the door with my bag, change of clothes and all of my gear for running it. I walked to the bag drop area and then George Square. 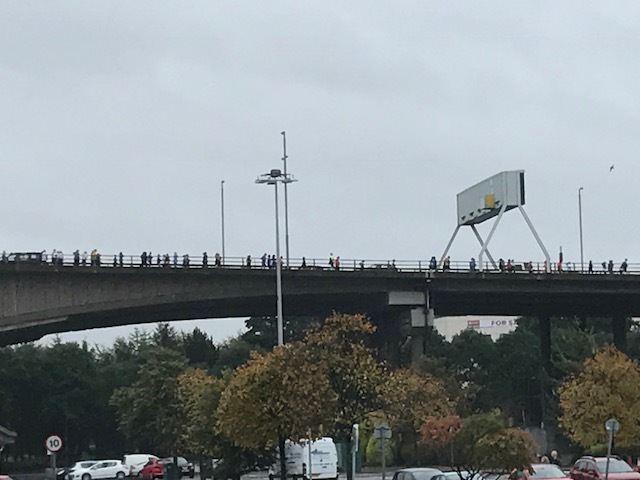 Seeing all the runners going over the Kingston Bridge for the 10k was cool, with me, and many other runners heading for the centre of town. I decided I’d out no pressure on myself for most of the run, and I’d just run and see what happened. Try not to push it too much (as I was back to work this week, with a big week ahead of me) … but still join in and have a good time. It’s the first time in many years that I’ve not been pacing at it, so it was a bit novel for me to be just doing it for me. So due to my high heart rate in the last week (Ie possible reduction in fitness!!) – for the run, I decided I’d mix it up a bit and not run by heart rate as I usually do. 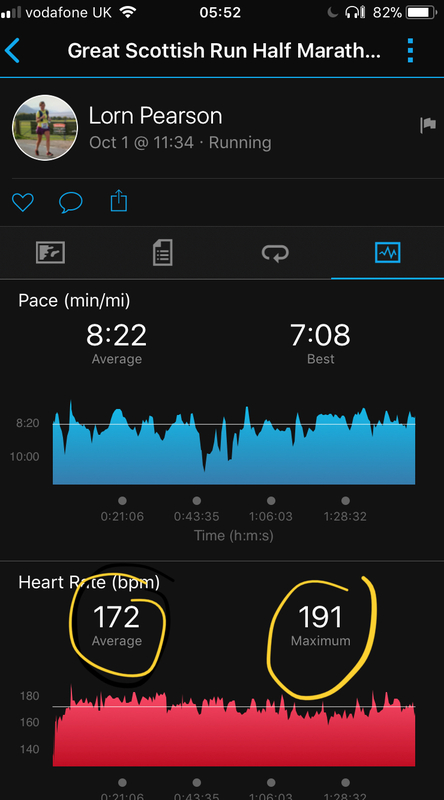 For races I usually push my HR up to about 165 and keep it there, then push it up towards the end – using it as a limiter so I’m not working too hard. I changed my tactic to running by pace. I decided I wanted to run sub 2 hours, so if I ran under 9:06 minute miles, I’d do it. 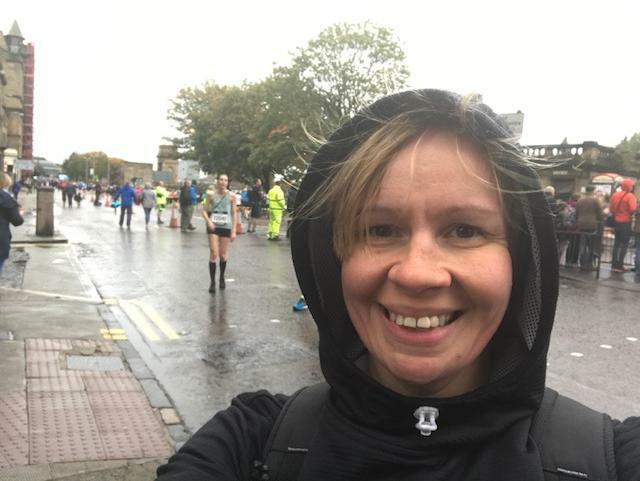 I’d also decided not to wear my water pack as there would be plenty water en route, and I wore my cap to help with the rain not being in my eyes, and three gels. One double espresso one for just before the start (125mg caffeine) and 2 berry ones (75mg each) plus energy. At the start I got my bag on the baggage bus smoothly and waited around 20 minutes sheltering behind a building at first, then under a nice tall man’s umbrella (thank you Philip!). I squeezed in under it and had a chat with him and his parents. 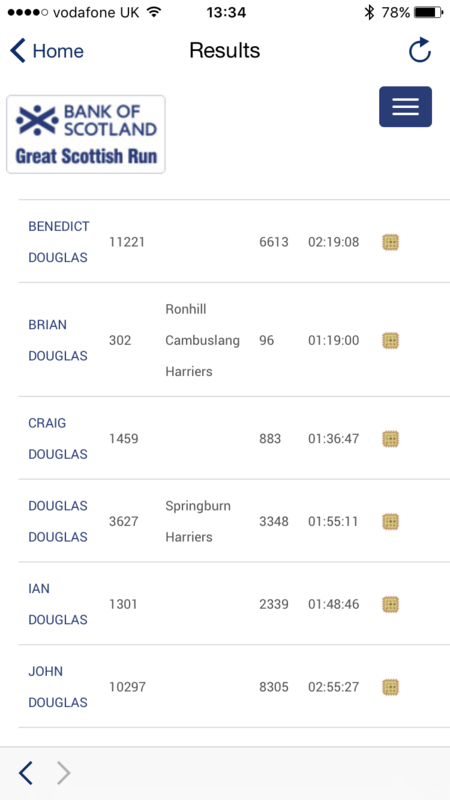 He was from Helensburgh, and was running it aiming for 1:30. 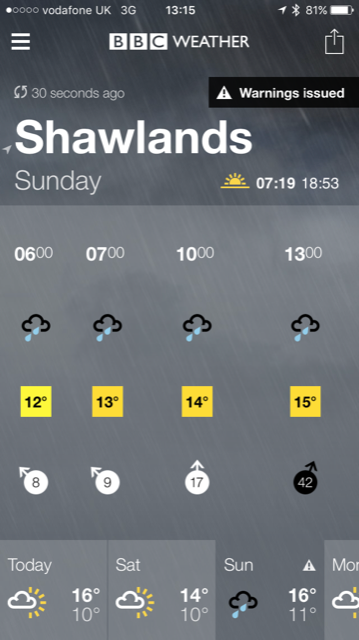 I was joking with some other runners that I didn’t think it would rain… ha (wishful thinking). Then about 15 minutes before that start it came down really heavily. We waited until about 1120 (10 mins before the start) before going into the white pen, then made our way into the usual warm and anticipating huddle at the start. I popped my double espresso gel, just before the start, and waited patiently with all the other runners. 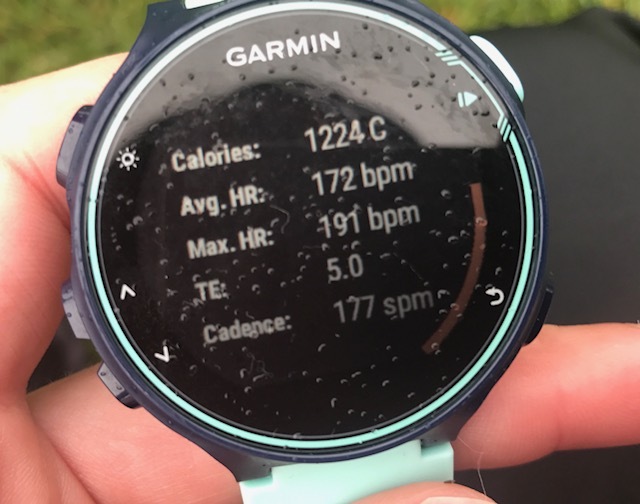 Hoping the rain wouldn’t get too heavy, but also knowing that when it rains when you’re running it’s not all that bad as you’re warm, and focusing on running. 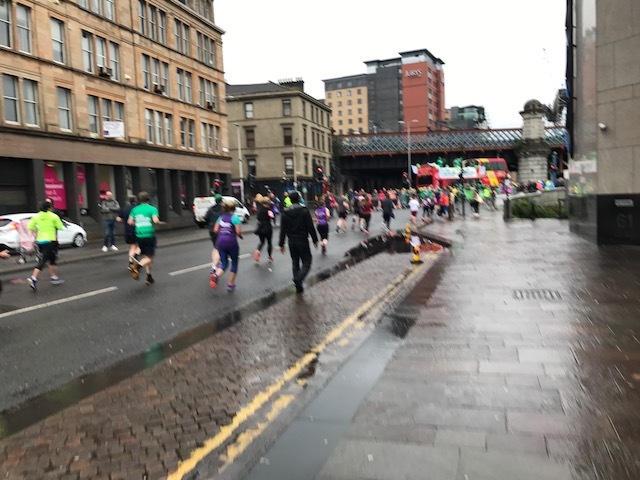 I was maybe 4 minutes from the start, at the first corner at George Square, and it seemed like there were men all round me. I spied the 1:50 minute pacer, and I my competitive self probably subconsciously came in to say I could do that. The elites were announced, then not long after we started. I probably started a bit quick but used the hill on st Vincent street to regulate my pace a bit slower. 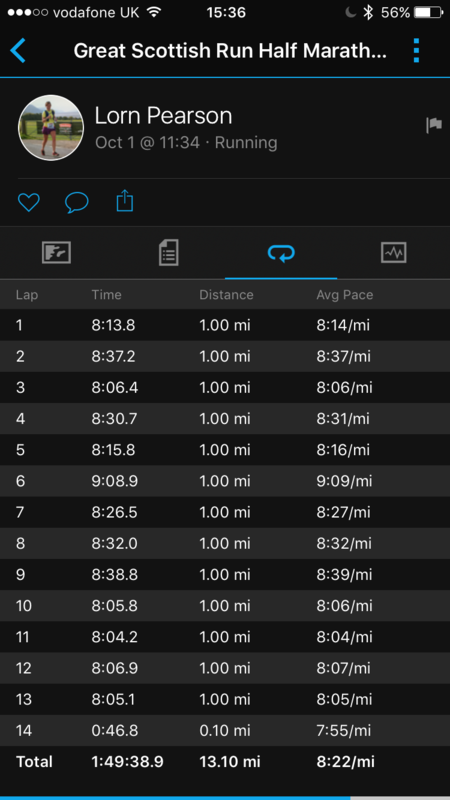 I was using actual pace and average on my garmin and seeing what was happening. The first mile ticked off at 8:14, and I was keeping up fine with the pacer, just ahead of her, so decided I’d try and see how I got on. I knew I could pace myself but could use her as a kind of marker if she went ahead of me (or not). The crowds were good, despite the weather, and there were plenty of marshals and water stops along the way. Over the Kingston bridge, pulling back a bit on the hill. Coming off the bridge I came across Anne Williamson who does lots of marathons and half’s and had a good wee chat with her. Then onwards towards Seaward Street and up to St Andrews Drive, I know it well because it’s my local neighbourhood. So I knew we were coming up to slow steady hill. On the way up there I had a gel in my hand, but my hands were wet with the rain and I managed to drop it in a bottleneck if runners do I couldn’t stop and had to let it go. I had been warming it up, but ended up just having the other 1 gel half way instead. 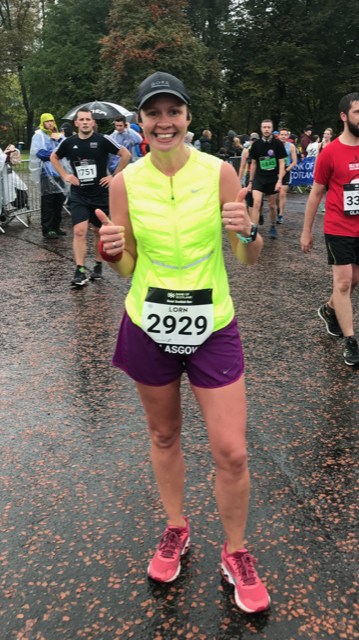 About mile three I spoke to the 1:50 pacer and it turned out to be a Bella road runner (I think) Mhairi, who had run ahead of me st Kilmacolm (small world). I asked her what the pace time for 1:50 was and she said 8:25 so I decided that would be my new target. I thanked her for taking time out to pace. I was keeping my pace around 8:10-8:20 Ish, but got a stitch around 4 miles in, which managed to ease off. I checked my HR and it was high, but I was ignoring it and keeping with pace. Around that time the pacer seemed to go ahead and I lost her, but I thought I was still on track for the pace. In Pollok Park I knew the route and the hills there too, so I knew when to push and when to ease up or let go a bit. At the top of one of the hills was Paul Clawson from Bella Harriers cheering people on, then came probably one of the best moments for me on the run. 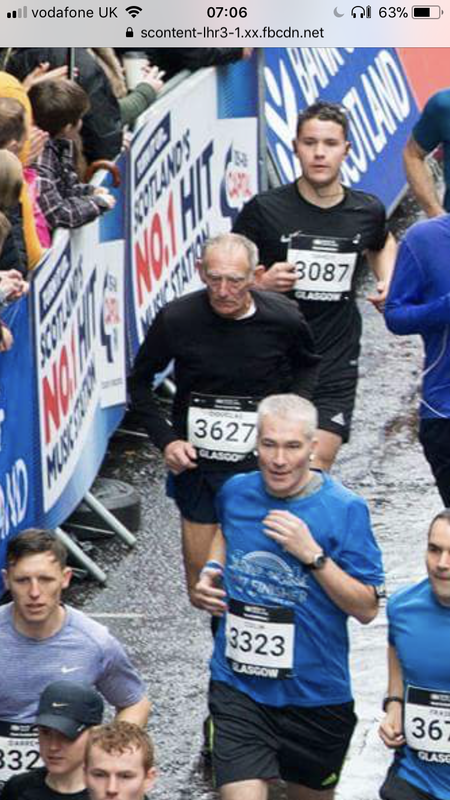 I ran along side an older gentleman, and I decided to tell him he was looking strong (he was). He was ticking along nicely, about the same pace as me, 8-8:30 minute miles. He thanked me, and told me hat it was his 34th year running this event. 34 YEARS. he did his first one in 1983 … (when I was there, although I didn’t tell him that). …and then coming out of Pollok Park I got a stitch again, so I let him know I’d be dropping back and I might see him again. I slowed back a bit, and he headed off into the distance, whilst I tried not to grimace too much in front of the large crowd just outside the park. I’d been able to take in plenty of water and had had about 4-5 bottles of water along the way. I like to be tidy for events and not litter, especially in my own city / neighbourhood, so I made sure that every bottle I had went in a bin. There were plenty of Council workers out (in the rain) picking up the litter, but (I think) if we all just took a bit of ownership and put our bottles / wrappers in bins instead of throwing them aside, it’d be better. I’m sure it didn’t add much time onto my run. The rain was pretty much constant, but not too bad or too heavy. My cap was protecting my eyes and I felt warm enough. The only bit where it was a little windy was coming off the squinty bridge in the last two miles, so that was fine. About 8 miles in my legs started to feel a bit sore, but I knew I could keep in going. My first 5k was about 26 minutes, and I got to 10 miles in about 1:33-1:34, so knew if I pushed it I could make it just under the 1:50 mark hopefully. 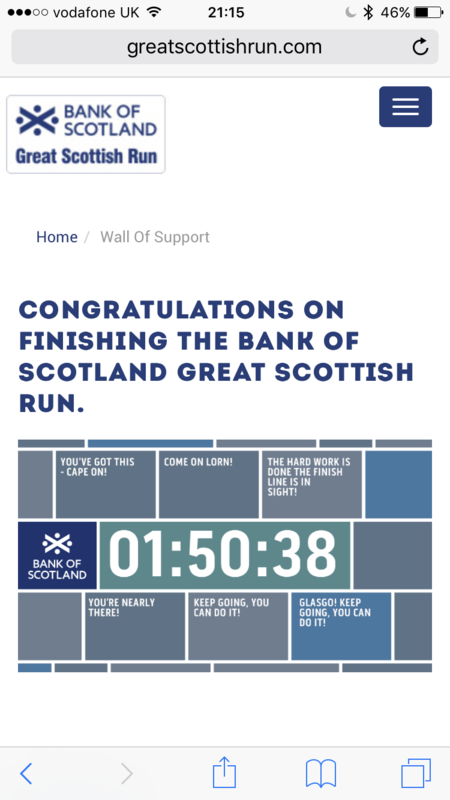 The course is kind of downhill towards the end (I realised after)… so I had that a bit on my side in the second half too. With 3 miles to go, I knew I had to crank it up and give everything I had left. 2 miles to go, if I did them in 16 minutes (8 min miles) I’d get under 1:50…. just under 1 mile to go and I got to the walk if support which is cool. (A mat under your feet notices you’re there then any messages friends have sent you come up). Not far to go and I heard / saw Stephanie from the Bella Harriers (and previous pacer) cheering me on then a little further along just before the end I saw some colleagues from work which was nice. It had been getting hard along that stretch, but I was able to keep pushing on. 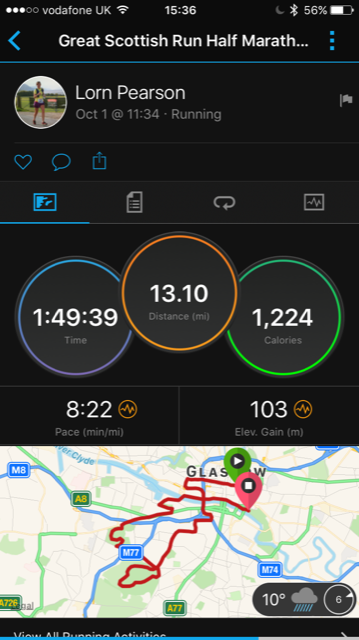 I could tell my watch was a little ahead of the course, so just after coming into Glasgow green (and before the finish) stopped it … to the tune of 1:49:38! 22 seconds under my target time. 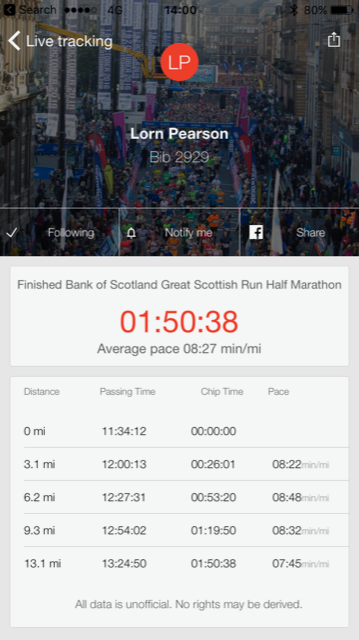 (My chip time was 1:50:38, but I always go by my garmin time – I was well chuffed with my effort anyway). 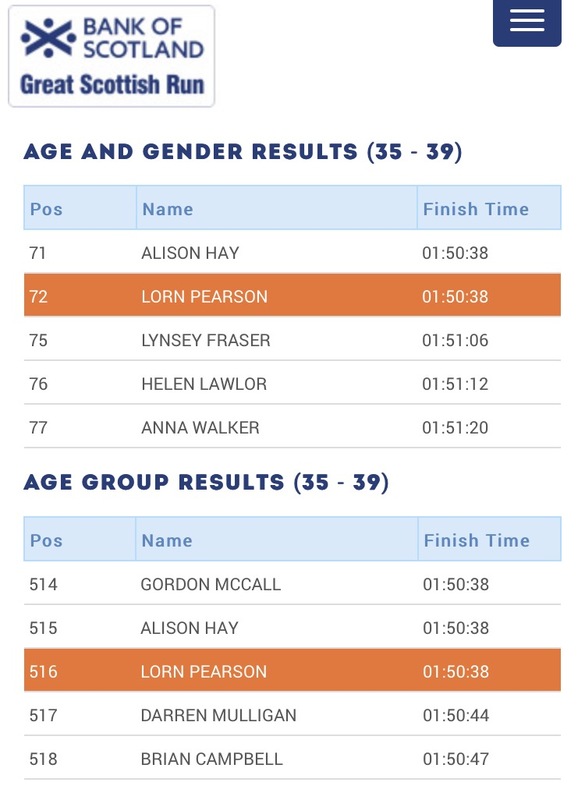 And 72nd female in my age group. After I finished I drank some more water and went to find the baggage bus, got dry and changed on it, then went and got a very tasty burger from a stall. Yum. 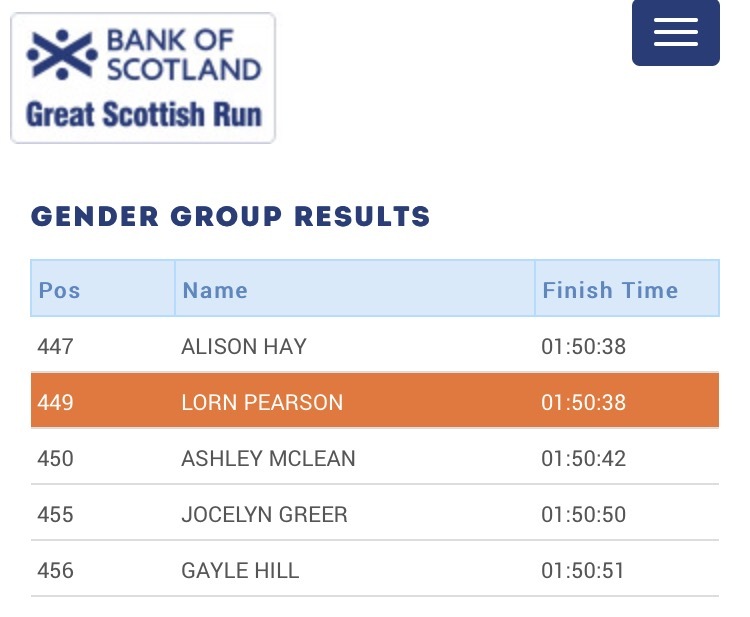 I was chuffed with a good run, that I could have dipped out of, but I’m glad I made it along. Avg HR was 171, max 191 so I was working very hard, but it was worth it. And in total I did about 35,000 steps for the day. 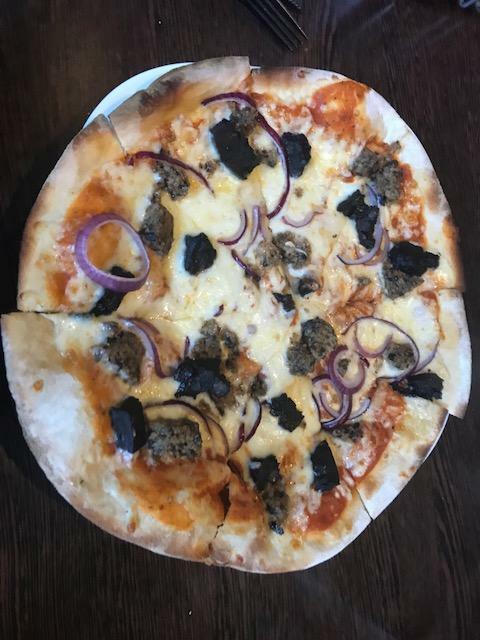 So the small haggis and black pudding pizza I had for my dinner was well earned too. At the end of the race, I was soaked through. Maybe not through to my pants, but near enough. I met Chris from work at the end (randomly) and he took a couple of pics of me right as I finished. 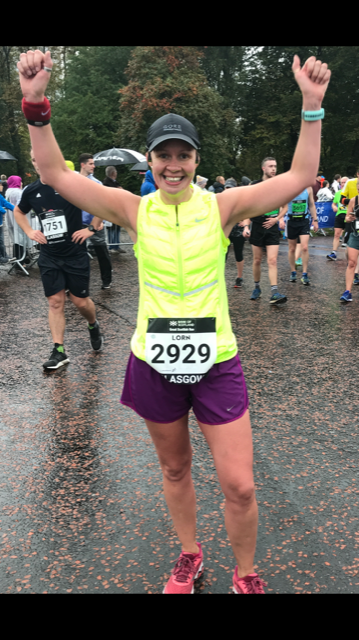 Happy to be finished – it was a good event, well organised and well marshalled. I just hope they manage to clear up all the race debris people left behind. Back to work on Monday, massage on Tuesday… my legs are ok, but there are other things that are sore, back and shoulders lol. I must have been tended up quite a bit. No doubt when I get my massage I’ll realise just how sore I really am! All good anyway. 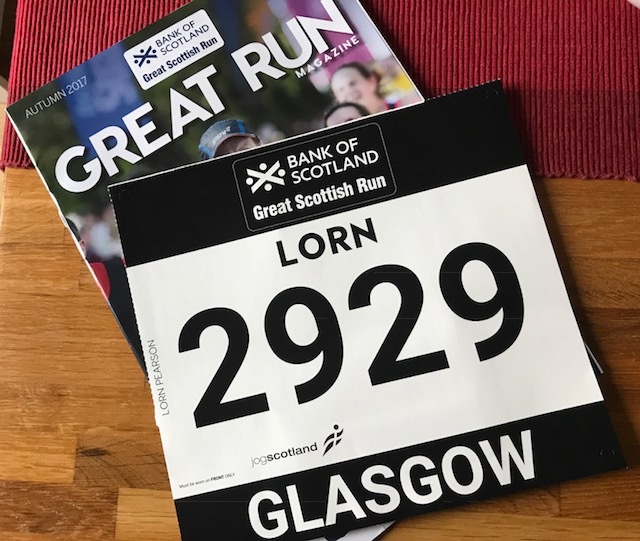 Did you do the great Scottish run? How did you get on?